I have just a bit more work to do to polish this version of the journal page, smooth out some of the details, revise the background a bit and put a thick finish on it, but it’s mostly done. Artist details: mixed media: graphite, charcoal, colored pencils & chalk pastels, acrylic, image transfer (a portion of my son’s face). I really wanted to capture how I felt about my son when he was too little to remember. Thinking about my kids is a big part of my bliss, and this really says it all. I was so young myself that I really wanted to show him how very much I wanted him and loved him and hoped that I could be a really good mom to him. 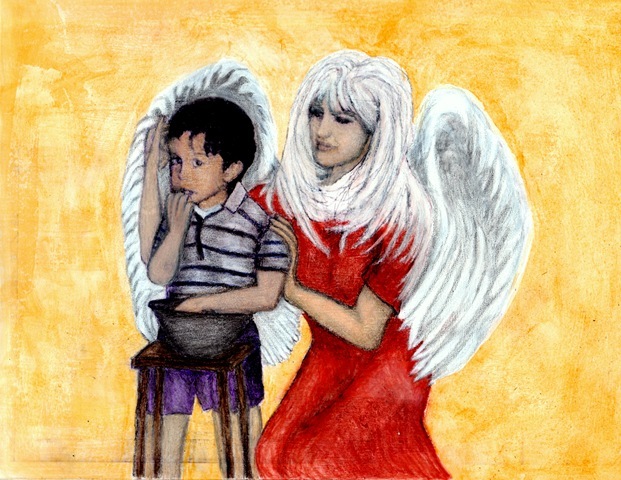 He was indeed my little angel. This journal page is a reminder of how precious he was and how privileged I felt to be his mom.